Come join us on April 19th at 6pm at our favorite South Sound restaurant, JW in Gig Harbor, for our first-ever Winemakers Dinner! Looks like Chef Eddie has done a great job pairing our wines with some delicious food! Here’s a peek at the menu. Save the Date – Release Party! Be on the lookout for details about our upcoming release party on December 15th and 16th! Last press of the season! 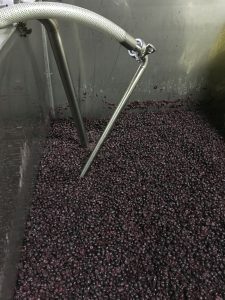 Kiona Cab free run juice ready to be pumped into barrel. 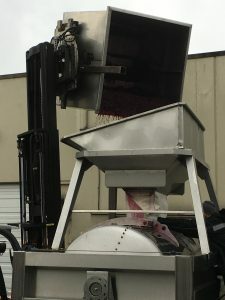 Remaining juice/berries dumped in press. Cab juice in the pan!